Zaofu is the last holdout for Kuvira to take over the Earth Empire. We open up with President Raiko deciding that NOW he will do something about Kuvira (I seriously don't like that dude) since Kuvira and her whole dang army are on the Su's doorstep. I mean, how did Kuvira convince these people to fight AGAINST the peaceful stronghold of the Earth Kingdom? Unless maybe they're jealous of the metal bending city? I dunno. This is Kuvira's army there to "show strength" and definitely not "threaten" oh no of course not. So anyway, Kuvira decides to use Bolin to manipulate Su (doesn't work) and he and Opal are in a fight (hate that a lot). 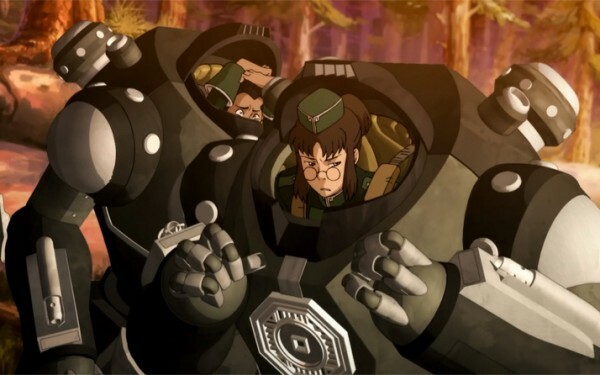 Kuvira's also forcing Varrick to use spirit vines to manufacture a crazy powerful mega weapon but it's very unstable. He and Bolin try to bounce and that doesn't go well. But what DOES go well is the amazing suits they fight in OH MY GOSH MORE OF THAT PLEASE it was like Iron Giant all up in there. And lavabending Bolin is so fierce I cannot even. Zhu Li goes ultimate badass in that Iron Giant suit, y'all. 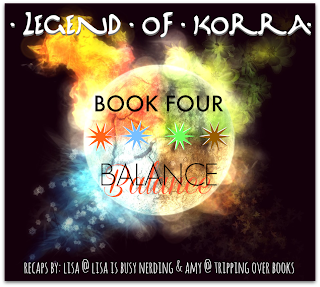 How Korra fits into all of this is basically showing up a bit too late to help either side change their mind and no one wants to budge. Korra doesn't want to force anyone to do anything...but I'm not sure what the resolution will be otherwise. I mean, Kuvira has FORCE and Su has FORCE and they are both stubborn as all get out and want opposite things. I'm wondering if maybe that's why the C plot was to have Asami and her father tentatively reuinte by admitting faults and attempting forgiveness? That bullying doesn't have to be met with bigger bullies? Are we going to see those "reeducation camps" that Kuvira is sending people too? I'm terrified. It's even worse that the ideas for this book are based in our history. Ugh. I forgot that Su's twins were so hot. They're like a perfect mashup of Mako and Bolin. Delightful. There were at least 5000 incidents in my notes in which I wrote "Kuvira be cray!" but the most terrifying is definitely the reeducation camp. I feel like each episode is ending with the biggest cliffhangers EVER and it is killing meeeee. Any craft nerds out there?